Update: Despite French President Emmanuel Macron letting his people "eat cake" with a six-month suspension of the government's new "climate change" fuel taxes, the so-called "Yellow Vest" movement which has been protesting throughout France for more than three weeks is still spitting mad. 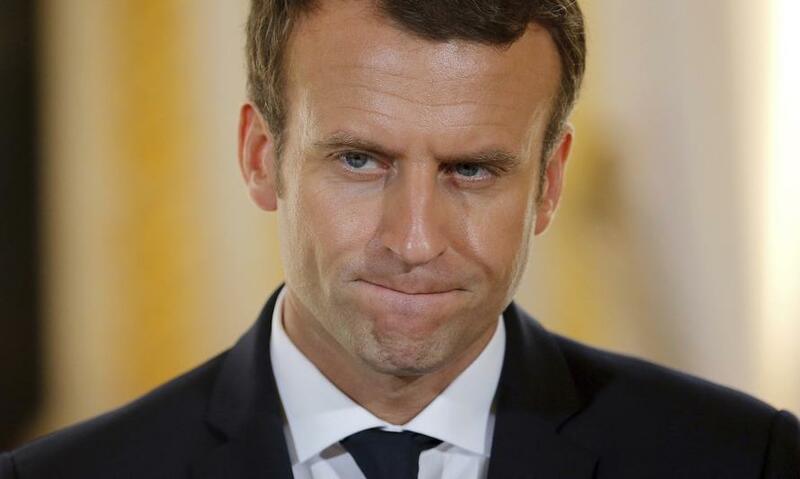 With his popularity rating at record lows (recent polls put it at around 26%, on par with Hollande), his capital city burning and the populists he defeated during his stunning electoral victory last year making serious electoral inroads, French President Emmanuel Macron finally caved, and on Tuesday ordered a six month suspension of planned 'fuel taxes' which spurred widespread and destructive protests across France over the past three weeks. "No tax deserves to endanger the security of the nation," Philippe said in a televised address, who on Monday held separate meetings with opposition party leaders, in which they demanded the scrapping of the planned increase in fuel taxes. The same day striking students closed down 100 high schools and rising fuel shortages were reported in some parts of the country. The suspension has come in the form of a "time limited moratorium". Though a permanent suspension remains a possibility (particularly since demonstrators are already planning another round of violent rallies where 120,000 protesters were expected to try and reenact the storming of the Bastille). But there's a catch: If taxes must be cut, then public spending will also be scaled back, Macron said; in other words once the smoke clears the anger will be even greater as social welfare programs are slashed. The PM also explained natural gas tariffs won't increase this winter. 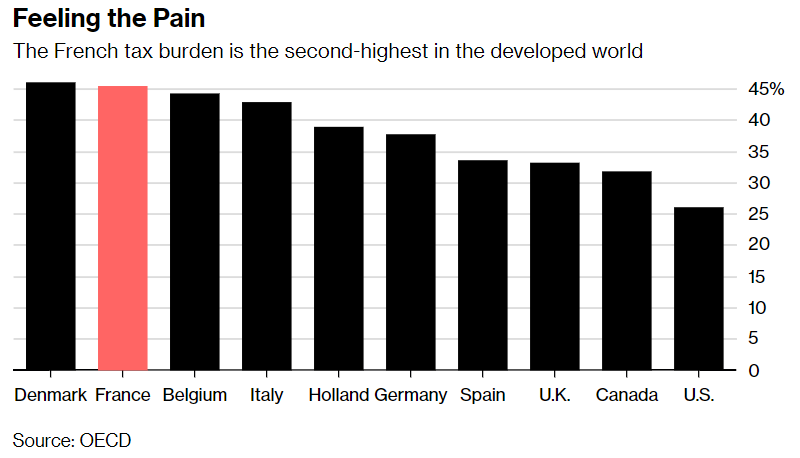 The "yellow vest" movement - which kicked off with paralyzing protests on Nov. 17 as word of the protests spread on social media - has won a crucial victory in its attempt to force Macron to reverse a policy that many have decried for squeezing household spending at a time when France's economy (and indeed economies throughout Western Europe) is struggling with tepid growth. 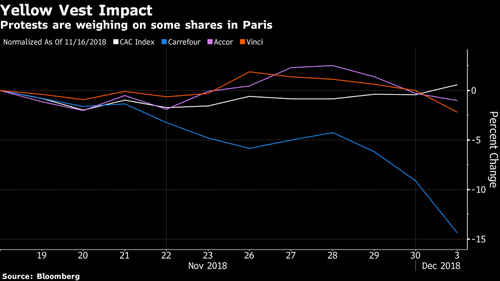 The protests have even had a negative impact French shares. 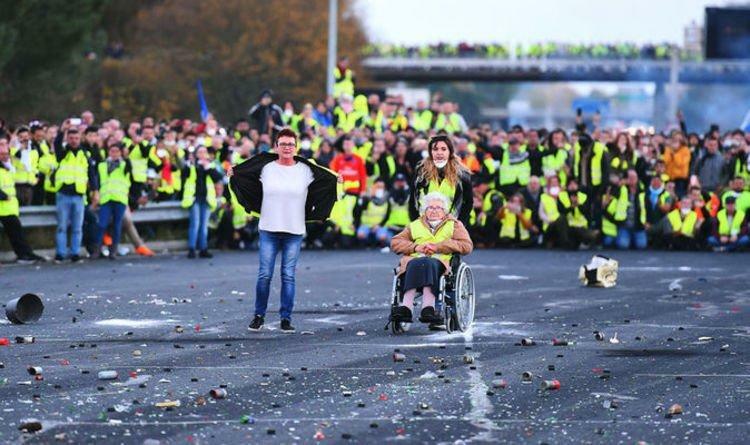 The movement was named for the highly visible "yellow vests" that all French motorists are required to store in their cars. Macron justified the gas tax by saying it was essential for combating climate change. But his decision to suspend the tax marks a deeply embarrassing moment for the president, who is in Poland this week to discuss actions to combat climate change with other European leaders. Already, a handful of deaths have occurred during protests over the past few weekends, further stoking the public's anger. Acts of violence were widespread during the latest rally, as the Arc de Triomphe was defaced and roads off the Champs Elysees were damaged. The demonstrations have reportedly hurt retail spending and damaged the French economy during a holiday season that many retailers had been depending on to help push them into the black. Macron successfully marketed himself as a pragmatic centrist during the 2017 French election. But a series of gaffes, scandals and policy missteps have helped him earn a reputation as the "President of the Rich" (before serving as president, Macron was a former economy minister and investment banker). To help combat this negative perception ahead of European Elections next year, Macron said he's considering other "populist" policies like raising the minimum wage. While it wasn't immediately clear if Macron's decision to suspend the tax would be enough to placate the seething anger of the French people - and it is safe to say his caving has merely emboldened the French to demand even more - but party officials have cautioned that he might need to back down on other policy "reforms" like cutting pension benefits.